Cake shapes - what to choose. Round cakes are one of the most popular shapes a wedding display showcases. The round shape of a wedding cake also opens up many doors for decoration, as a collection of satisfying textures and colors are allowed. For example, draping an assortment of flowers over a round wedding cake is a common theme. The sharp lines and angles of a square wedding cake is a more modern statement. 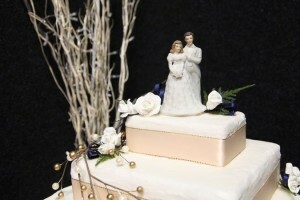 Often, couples choose to soften the display of their cake by adding flowers, light colours, or dainty embellishments. Sugar pearls and rolled fondant are also common selections of ornamentation. 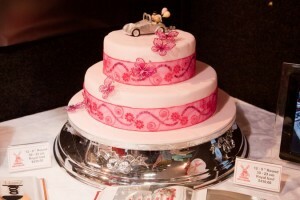 A table cake is small in size, but creates a beautiful centerpiece, where each guest table receives its own selection. A variety of decoration choices (flowers, candy pieces, and fondant) are possible, which replaces the traditional centerpiece of flowers and other selections. The shape of this wedding cake presents a flower-like or sculpted appearance that is sometimes referred to as “scalloped.” On the average, each tier showcases its own motif. A high amount of colour is often utilized. Soft decorations are commonly chosen and matched with varying textures. An example of this cake shape choice is seen with white fondant, sugar-paste accents, and swirls that are topped with sugary roses and sweet peas. When looking for a twist on the classic square cake shape, some couples are choosing the hexagonal selection that offers six different sides. Usually, decoration is kept at a minimum to highlight a clean and uncomplicated presentation. 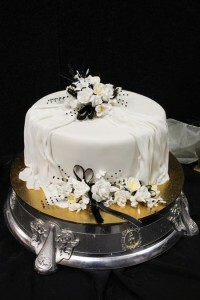 Guests are often quite taken aback by the display of such a cake, as the shape of the cake itself is seen as decoration. When moving further away from the simple, traditional shapes of wedding cakes, you may consider an off-kilter design, where each tier is turned 45 degrees. This remarkable display gives the illusion that the cake is actually turning on its own axis. In the end, cake decorators have more space to work with for their embellishments, which includes real or fake flowers, roses (sugar paste), and ribbon. Cake shapes and wedding decorations.